Worked on this sat on the bleachers at the ball field on the Fourth of July while the Conwell/Forhan clan played baseball. 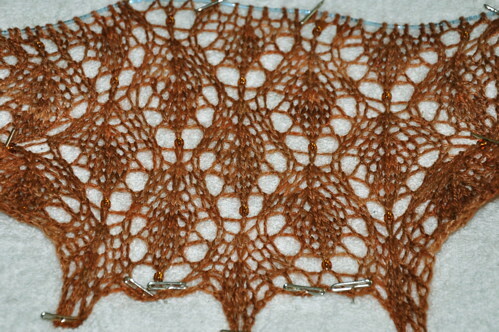 The cast-on is perhaps a little too stretchy, I did it over a US8 needle, working on a US7 for the lace. Next time I’ll do it with the same size needle as the rest of the work. I like the construction of a long cast on, a straight lace section, then short rows to make a curve. Several people have added garter or seed stitch edgings to prevent edge rolling. It’s not a perfect travelling project because every fourth row is beaded. For that, I’m using a 1mm crochet hook, holding the hook at an angle to the yarn loop, and sliding the bead down the hook and over the yarn. It works most of the time. The yarn doesn’t feel soft, it’s almost scratchy to work with, and not tightly plied. I’m hoping it softens up when I wash and block it. It’s 65/35 merino/silk, so I was expecting it to be nicer. Hopefully it will soften up in the wash. Also it has strands of plastic in it that I keep pulling out. It’s going to need a vicious blocking to pull out the lace pattern. I might have to get foam squares because my yoga mat doesn’t look big enough for the curve. Planning to do an extra lace repeat, and extend the plain section with some seed stitch if I have enough yarn. I am now obsessed with that pattern, thanks to you…. And oddly enough, I have some silver-lined root beer beads, too!